Of all the Pokemon to catch in Pokemon Go, Ditto is by far the most annoying. You've no doubt reached this Ditto guide because you've been wondering how to catch a Ditto in Pokemon Go, since it's not an easy task whatsoever. Well, it can be if lady luck is on your side but for most people, it takes quite a while to learn how to catch a Ditto in Pokemon Go. Let us help you, because Pokemon Go can be frustrating at the best of times, with this Pokemon Go Ditto guide. 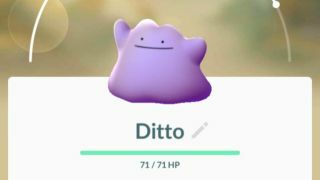 The trick to catching a Ditto in Pokemon Go is knowing which Pokemon Ditto can be found inside. Wow, that sounds creepy. Let us explain. Ditto disguises itself as other Pokemon, because it can mimic their form with the Transform ability - it's not literally inside them. As part of the various Special Research tasks, you may be required to catch a Ditto, so while it's impossible to see a wild Ditto, you can find one easier by knowing which Pokemon it can look like. Here's everything we know about catching a Ditto in Pokemon Go and all the Pokemon Ditto can be disguised as. The even more frustrating thing about catching Ditto is that you’ve probably already caught one at some point when you weren’t meaning to but the minute it’s a requirement, there’s no sign of the purple squish monster. The good news then is that Ditto is actually hiding in some very common Pokemon. You’ll just need to catch them all to find out which ones are which. It’s important to note that you need to go all the way through the catch screen and actually succeed at catching the Pokemon. Ditto only reveals itself once this has been successful. Instead of the regular ‘Gotcha’ when you manage to snare your creature, an ‘Oh?’ will appear above the ball and Ditto will reveal its true happy smiling self. Voila. Mission accomplished. Which Pokemon can be Ditto in Pokemon Go? Here is the full Pokemon Go Ditto list, split into generations. These can change and more Pokemon have been added in the last two years to make the hunt easier. Remoraid is a relatively new addition to the roster. You will see that these are all, with the exception of Yanma, relatively common Pokemon so make sure you have plenty of Poke Balls to catch and check ‘em all. Catching a Ditto is all based on your luck but there are a few ways you can make sure you are maximising your Pokemon Go time. Always keep an eye out for the target Pokemon on your nearby list. While they are all relatively common Pokemon, it’s helpful to be able to see what’s where, especially as more and more Pokemon are added to the mix. Thanks to confirmation from The Silph Road, you can catch a Ditto from both lures and incense. If you’re staying in the one spot but don’t want to miss out, pop on a lure and/or incense, target the list Pokemon and you might just find Ditto comes to you instead of the other way around. Unlike shiny Pokemon, which are entirely random and not shared by fellow players, Ditto can always be found inside a set Pokemon spawn. This means that if you are looking for a Ditto and a fellow player finds one, if you can get to that spot, you’ll get it too. If you are subscribed to a Pokemon Go Discord group, ask players to keep you updated in your area but be fast as they won’t stay around long. This won’t help your odds of catching Ditto but if you are heading out on a Ditto hunt you’ll be earning stacks of XP as you check every Pokemon you encounter. Crack a Lucky Egg and you will double this XP for half an hour. The same goes for Star Pieces. It’s time to maximise the grind, people. You cannot hatch Ditto from an egg. It must be caught with a Poke Ball using the above method. Once you actually have Ditto, you’ll find it has an intriguing use in Pokemon gyms. Take it in to battle and you’ll find that it transforms into its first opponent’s form and takes on that Pokemon’s move set, while keeping its own CP. Bear in mind though, it only changes form once for the first opposing Pokemon it encounters so you’ll be stuck with that one for the full gym battle. Ditto is a Normal Pokemon. While you will get 3 candy for catching it as is standard, there is no evolved form. You can power it up though as with other Pokemon with a combination of candy and Stardust. If you want to walk with Ditto as your buddy, it will earn a candy for every 3km achieved. Once you've got a Ditto, mission complete! Until it inevitably appears again as a Special Research task, at which point you can refresh your memory by revisiting this page.